Welcome to Day #13 of Chocolate and Halloween wEEKs. 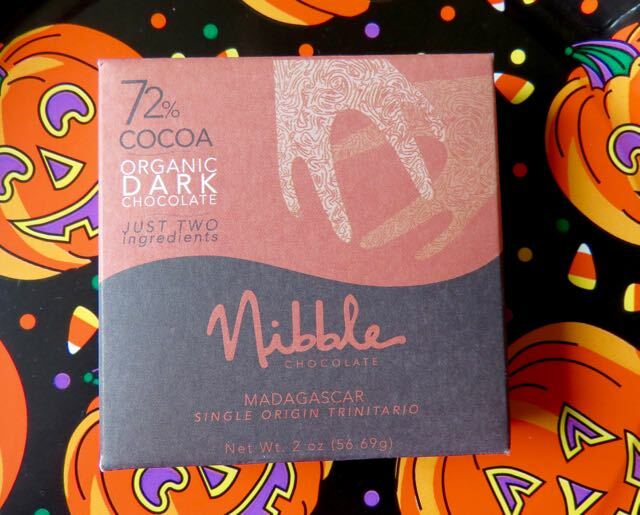 Today's Madagascar Single Origin Trinitario bar was created by Nibble Chocolate, LLC (San Diego, CA) founders and bean-to-bar chocolate makers, David and Sandra. The company offers single origin bars from at least five different countries, at three different percentage levels. They promote the 72% bars as offering a milder dark chocolate flavor than it's 77% and 85% cocoa siblings. Makes sense. Today's 72% dark bar had an aroma and flavor with brown/coconut sugar, raisin, and sightly earthy notes. It did not have the often characteristic berry flavor that some Madagascar bars have, but it did have a hint of dried plum.